Slide into spring surrounded by rolling hills, relaxed hospitality and acoustic music. 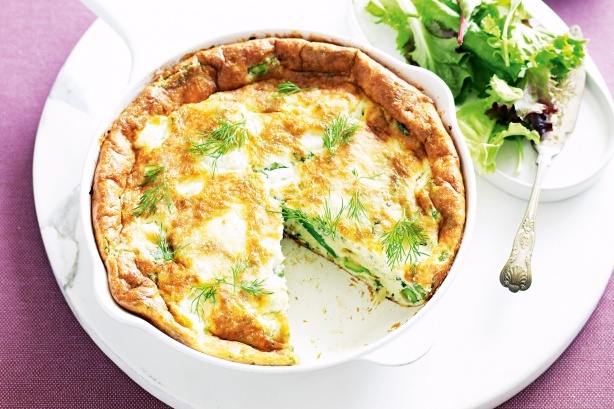 This tasty frittata can be eaten cold or warm straight from the oven. Fillings can be substituted with any of your favourite ingredients. Preheat grill on high. Whisk the eggs, cream and dill together in a medium bowl. Season well with salt and pepper. Melt the butter in a large (20cm base measurement) frying pan over medium heat until foaming. Add the leek and cook, stirring, for 5 minutes or until leek softens. Add the asparagus and cook, stirring, for 2 minutes or until bright green and tender but still crisp. Pour egg mixture over the leek mixture in frying pan. Gently stir to combine. Reduce heat to low and cook for 4-5 minutes or until frittata is almost set but the top is still runny. Remove from heat. Sprinkle the goat’s cheese evenly over the top. Place the frying pan under preheated grill for 2 minutes or until frittata is set and top is lightly browned. Use a spatula to loosen the frittata and slide onto a clean work surface. Cut into wedges and place on serving plates. Serve immediately with toast and mixed salad leaves, if desired.